I am a big fan of eating a lot of fiber in your diet and when it comes to Fiber One products, they are pretty great! My mom has been a long time fan of the original Fiber One cereal and I like it too. I was sent a box of the new Fiber One 80 calorie honey squares cereal for my review. They are a mixture of corn and wheat squares. The cereal is absolutely delicious! It is shocking that it only has 80 calories (per 3/4 cup serving). It tastes likes a sugary kids cereal (in a good way) but is not. In fact, it only has 3 grams of sugar and has 10 grams of fiber. The cereal also is full of vitamins and minerals. One thing that is great about high fiber cereals is that it can help keep you full longer and it may help to regulate your digestive system. I was also sent a Fiber One pedometer and an iPod/smartphone holder which will be great for my husband for when he goes running. I was impressed with how great this cereal tasted and will definitely buy it again. 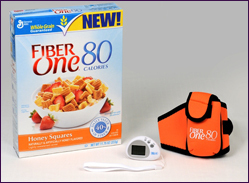 The giveaway will be for: 1 box of Fiber One 80 Calories Cereal, 1 sensor pedometer with USB connector to chart walking progress. 1 neoprene iPod/smartphone holder with armstrap to one lucky reader of The Nutritionist Reviews. The giveaway is open until Midnight on Tuesday August 23rd. Winner will be chosen on Wednesday August 24th using Random.org. The winner will have 48 hours to respond or a new winner will be chosen. Tell me what your favorite high fiber food is (for example: a fruit or vegetable, whole grain, etc). -Like Fiber One on Facebook (1 entry). -Write on the Fiber One Facebook page that The Nutritionist Reviews sent you (2 entries). Pistachios are a great snack. They contain monounsaturated fat (the good fat), no cholesterol and 7 grams of fiber in a snack serving! I love apples - a sweet snack full of fiber! Found you through Thirsty Thursday. Hoping you will connect with mine and follow too. My favorite high fiber food is wheat pasta noodles! I love brown rice and pears for fiber! My favorite high fiber food is broccoli. I like FiberOne on FB as Anne Loyd. I love snacking on Almonds. I love Triskett crackers and shredded wheat cereal. all high fiber! My favorite high fiber food is 13 bean soup. I entered the Bisou Boutique giveaway! Fiber one is probably my favorite, but I love apples, beans, whole wheat bread, oatmeal :) all that! entered into the bisou boutique giveaway too! I love whole grain bread. I really enjoy beans for a high fiber food. I love All Bran muffins. So yummy and high in fiber. My favorite would probably be Fig Newtons. I'd like to try this cereal. I enjoy whole grain wheat bread!